TORRANCE, Calif., Sept. 20, 2018 –American Honda Motor Co., Inc. President & CEO Toshiaki Mikoshiba yesterday presented the company’s annual Premier Partner Awards to 15 suppliers that have demonstrated excellence in quality, value and customer service. A special ceremony was held at the Westdrift Hotel in Manhattan Beach, Calif. to recognize the suppliers’ achievements and contributions to Honda’s business. The Premier Partner Award winners play an important role in supporting Honda businesses and operations. They range from freight carriers to consulting agencies. Among this year’s recipients are five first-time winners. Standing L to R: Ray Leonard, “K” Line America, Inc.; Damon Joshua, MarketSource; Patrick Santy, George P. Johnson Company; Robert Rodriguez, Jr., RMI International Inc.; Dave Lockard, C.A.R. Transport Inc.; Dave Fleenor, BNSF Railway; Ken Golden, Sinclair Printing Company Seated L to R: Ryan Gaylord, Altura Associates Inc.; Rex Watkins, Interstate Batteries Inc.; Mike Palmer, Crown Packaging; Stacey Crumbley, Targetbase; Mr. Mikoshiba, American Honda Motor Co., Inc.; Anna Crowder, Alpha Omega Solutions, Inc.; Chris Morning, Elanders Americas; Andreas Hect, CCC Information Solutions Inc.; Neal Vanskiver, Johnson Controls Security Solutions, Inc.
American Honda also recognized MarketSource with the second annual Impact & Excellence Award, an honor presented to a company that has had a positive impact on the American Honda enterprise. MarketSource has played a key role in Honda’s recall of Takata airbag inflators, providing a team of dedicated specialists tasked with finding and facilitating airbag inflator repairs on high-risk vehicles. 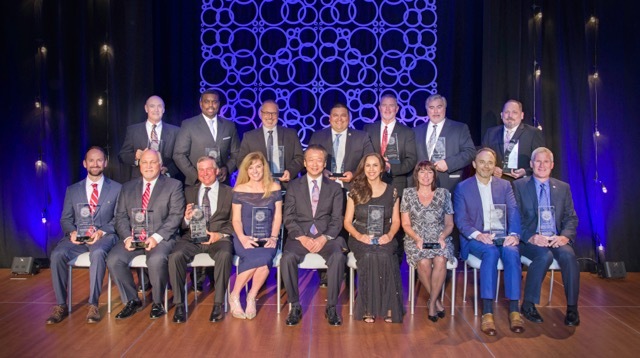 The Premier Partner Award recipients were selected from a pool of more than 1,000 eligible companies nominated by American Honda associates. They represent multiple industries and include small businesses and minority-owned operations such as Alpha Omega Solutions, Inc., Aquent Cloud and RMI International. Honda is committed to the establishment of long-term relationships with all of its suppliers based on mutual benefit and trust. The company works to bring greater diversity to its supply base by assisting potential ethnic minority and women-owned suppliers with workshops and other educational opportunities. The workshops provide a greater understanding of a variety of important issues including strategic alliances, capitalization and empowerment programs. The Premier Partner award program was established in 1998 to recognize suppliers who embrace American Honda’s philosophy of exceeding customer expectations. Based on its longstanding commitment to “build products close to the customer,” Honda operates 19 major manufacturing facilities in North America, working with more than 650 suppliers in the region to produce a diverse range of products for customers locally and globally. In 2017 more than 90 percent of the Honda and Acura automobiles sold in the U.S. were produced in North America, using domestic and globally sourced parts.